For over two decades, actor Michael Jai White has become the go-to guy in Hollywood for action movies and television series, thanks to him being a martial artist and a black- belt holder in Taekwondo as well as in seven other styles. The former stuntman is best known for his works in movies like “Universal Soldier”, “Mortal Kombat: Legacy”, and “Spawn”, where he became the first black person to portray a major comic book character in a motion picture. Read on to find out more about his early beginnings, family life, net worth and other facts. White was born Michael Richard Jai White in Brooklyn, New York on the 10th of November 1967 and was raised by a single mother following the death of his father in his infancy. At the young age of 7, White began training in the martial arts, starting off with Jujutsu and then shōtōkan before moving on to other styles. As a teenager, his family moved him from Brooklyn, New York to Bridgeport, Connecticut, where he attended Bridgeport Central High School and then Central High School, graduating in 1985. Michael Jai White then attended Yale University, Brown University, and H.B Studio, where he studied acting. However, before fully going into the profession, White worked as a teacher. He taught emotionally disturbed children for three years before making his acting debut in the film “Toxic Avenger” part 2 in 1989. His breakthrough role, however, came in 1985 when he was cast to play the role of heavyweight boxer Mike Tyson in the HBO film “Tyson.” Two years later, White was cast as Spawn in the movie of the same name. The role has earned him several award nominations, including a Blockbuster Entertainment Award for Best Male Newcomer. He went on to star alongside Jean-Claude Van Damme in “Universal Soldier: The Return” (1999) and then in “Exit Wounds” (2001) opposite fellow martial artist turned actor Steven Seagal. White went back to his martial arts roots for the movie “Undisputed II: Last Man Standing” (2006) among many others before he again showcased his acting reach by joining the cast of Tyler Perry‘s “Why Did I Get Married?” (2007), which opened in the box office on October 12, 2007, at number one, before appearing as a mob boss in “The Dark Knight” (2008). He reprised his role as Marcus in “Why Did I Get married Too?” before again doing some more music video appearances, first in Toni Braxton’s new song “Hands Tied” and then in Nicki Minaj’s “Your Love” where he played her martial arts teacher and love interest. In 2011, Michael Jai White for the first time in his career, took up the role of a director as he made his directorial debut in the movie “Never Back Down 2: The Beatdown”, which he also starred in. He again starred in its 2016 sequel, “Never Back Down: No Surrender” which he also directed. Michael Jai White has come a long way from his days as a martial arts student to becoming a teacher and then an actor. Thanks to his numerous on-screen roles, White is said to have an estimated net worth of $3.5 million which has afforded him a lavish lifestyle that comes with that territory. 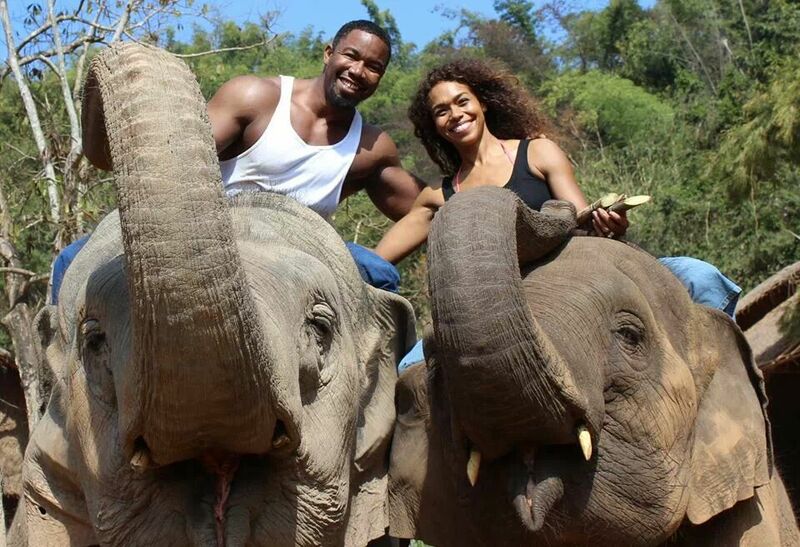 Michael Jai White has been married twice. His first marriage was to Courtney Chatham in 2005 with whom he had a daughter named Morgan. They couple separated for unknown reasons in 2011, leaving room for White to again walk down the aisle with actress Gillian Iliana Waters in 2015. White and Waters began seeing each other in 2013 before they exchanged vows in what was described as an intimate but extravagant ceremony in Thailand. In addition to his daughter Morgan, White has a son from a previous relationship named Jai Jordan White. He and Waters currently have no children together, although, Waters herself had two children from her previous marriage. There are no much details of Michael Jai White’s brother. However, in a tweet, he made on 11th October 2014. White made mention of being “proud of his brother #omariHardwick who as at then was working on his second season of Power. Omari, as we know, is an American actor who is doing well in his own space. There are no proofs that he is related to Jai, rather Jai might have made reference to him as a brother being a parlance common among black folks. The two, however, look-alike when spotting the squared beard or van dyke mustache style.